Three little girls chase a kite through the meadows. The kite is caught in a tree. One of the sisters pulls it down declaring it broken. Gerta points out that the ribbon is still beautiful. A man comes along and tells the girls it was his kite. He tries to take two of the girls. Ingrid freezes a tree and the branch collapses on the man. She is frightened by her powers. Ingrid’s sisters tell her that they are proud of her for saving them and that they will help her learn to control herself. The sisters keep the yellow ribbon from the kite. Years later Ingrid still finds her powers to be a burden. Helga and Gerta prepare for a ball. Ingrid does not want to mess anything up for them. Helga introduces a Duke to her father the King. Everyone dances. Ingrid watches in the shadows. Her sadness causes snowflakes to appear above her head and she leaves. The princesses find their older sister planning to leave. Ingrid tells Helga that she should be the next Queen. Gerta tells them that she has heard of a powerful wizard from the land of Misthaven that can help Ingrid. The sisters travel to meet Rumpelstiltskin. He does not seem to believe that they need his help as sisterly love in itself is magical. He does present Ingrid with a pair of blue gloves she can wear. He tells her that if this does not work there is also a magical urn she can trap herself in. He tells them he needs an exchange to make a deal and desires the yellow ribbons the sisters have kept all these years. Ingrid’s sisters tell her they feel they are enough to help her and that they should not give up the ribbons. Ingrid makes the decision to give up her ribbon and the sisters follow suit. Ingrid sits in the garden outside her family’s palace holding the gloves and the urn. The Duke introduces himself and makes a pass at her. She is shocked and uses magic to push him away. Helga finds them. The Duke lies and tells Helga that Ingrid tried to kiss him. Helga knows better and tells him to leave. The Duke threatens to tell everyone that the future Queen is a monster and that is why she is kept hidden away. Ingrid is angry and tries to zap him but instead zaps her sister as the Duke runs off. Helga turns to ice and crumbles. Gerta finds Ingrid with their dead sister. She is shocked and calls a tearful Ingrid a monster. Ingrid insists it was an accident but Gerta grabs the urn and traps her. Gerta visits the rock trolls still clutching Ingrid’s gloves. She asks for a spell that can erase all of Arendelle’s memory of her two sisters. He tells her it can be done but warns all magic comes with a price. 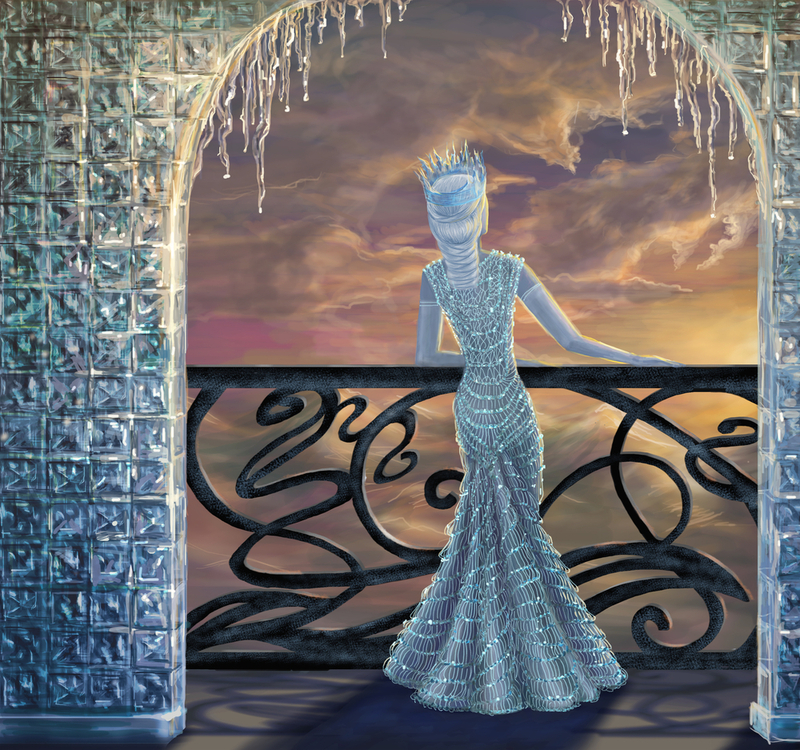 The Snow Queen goes to the tower to place the mirror in there. I look through books as Robin comes to see me again. He tells me that he cannot help his feelings. I insist he must forget me if he wants to save Marian. Emma shows Elsa a spell written in Runes. Elsa can read it. She helps Emma practice her magic. Mary and Neal attend a ‘Mommy and Me’ class led by Cinderella and also attended by Aurora. Emma comes as the class is ending to find Mary. Cinderella talks about how the class really helps first time mothers. This hurts Emma who looks at Mary. Neal’s milk bubbles in Emma’s hand. Emma’s phone rings. David summons her to the Clock Tower. Emma is able to control fire. She uses it to shackle the Snow Queen who acts shocked. Elsa hugs Emma. They take the Snow Queen to an interrogation room in the Sheriff’s station. The Snow Queen still insists that Anna locked Elsa away. Emma sends Elsa off so she can talk to the Snow Queen alone. Once alone she tries to manipulate Emma by telling her that her family fears her powers. Elsa brings David and Hook to the tower. Belle is alarmed and warns them not to look in the mirror. Belle gets a glance of herself and realizes this is not the same mirror she saw in the Snow Queen’s hideaway. They realize that this is a set up and race to the Sheriff’s station which is frozen on the outside. Will and Robin run into each other. Instead of a confrontation the two men sit down for a drink. Robin asks of the woman that Will betrayed him and the Merry Men over. Will does not answer but instead tells Robin that despite what has happened with him and his failed love he still believes in true love and that it is worth fighting for. Henry is all dressed up for work as I once again flip through pages of the cursed book of Fairy Tales. He tells me his grandfather wants him to dress up for work now. I tell him I am trying to let Robin go but Operation Mongoose is still on. At work Henry sweeps and tells Rumpel that he wants to learn magic. Rumpel jokes with him and tells him he has something that can take something old and make it new and it is called furniture polish. Henry goes in the back to polish furniture as Belle comes in telling her husband that she and the others she is with need his help. He will go but before he does Hook makes a private comment to him that he knows something is off by how relaxed Rumpel is about the Snow Queen. The Snow Queen is using magic and Emma does not realize it as they argue. The woman tells Emma that her parents are happy their new baby is ‘normal.’ Emma is angry and slams the table. Something happens that makes her power uncontrollable and the force blows a hole in the wall. Emma is surprised but the Snow Queen is pleased and leaves. Emma walks out of the hole and everyone runs to her. She warns them to stay back as she cannot control her powers. She causes David to get injured and Mary snaps at her. Realizing what she has done Mary calls for her to come back as Emma turns and leaves. The Snow Queen smirks as she watches the scene. I still look through the book. Robin is back and this time he kisses me. I don’t stop him. Mary is sorry over what happened. Emma is not responding to anyone. Mary feels they failed her. The Snow Queen goes to see Rumpel. She surprises him by telling him she is ready to make a deal. She believes that he wants release from his dagger and to be able to stay magical outside Storybrooke. All she wants is Storybrooke. She tells him knows how he can get what he wants. In exchange she wants the yellow ribbons back. He is willing to hear what she has to say. The Snow Queen whispers in Rumpel’s ear.